Top Notch confirmed his place at the Cheltenham Festival, where his options include the JLT Novices' Chase, with a polished performance. Amore Alato and Baron Alco made the running but the other three members of the field were never far away in what was a tight Grade One. Top Notch jumped the obstacles with proficiency and Nicky Henderson's charge sealed victory with a fine leap at the final fence. Galloping resolutely up the hill, he scored by five lengths from Baron Alco, with Le Prezien another length and a quarter away third. Clan Des Obeaux, the 13/8 favourite, was most disappointing. Jockey Daryl Jacob, who was winning the race for a third consecutive year, said: "It was a great performance. That was a real test for him. He's not the biggest in the world but he makes up for it with his heart. "He deserves it. He's very, very consistent and he always tries his heart out. This was a big step and it told us a lot." Henderson said: "This is a real favourite. He's nearer a pet than a racehorse. 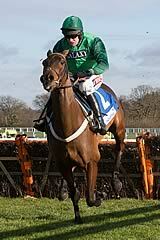 "He came as a juvenile hurdler and I thought that was all he ever would be. "He had a good year last year. He won the Morebattle (Kelso) and was fifth in the Champion (Hurdle) and had nowhere to go so we tried him over a fence. "He was beaten first time out (over fences). Then we found him two lovely, easy races and you could see him grow in stature and confidence. Daryl says the two and a half miles suits him well. It will probably be the JLT he'll go for at Cheltenham." The Seven Barrows handler continued: "He is still in the Champion Hurdle but after the last two races that is probably not the plan for Top Notch. His jumping to start with was good but it was hard work as he has not got the scope. "I'd say the JLT is what we've got to go to. It just gives him that little bit more time with his jumping. "He was a very good hurdler in his own right but he looks to be a better chaser now, which we never dreamt of." Sky Bet cut Top Notch from 16/1 to 7/1 for the JLT and representative Michael Shinners said: "His slick jumping puts him right in the picture for a race like the JLT and with question marks over what might actually run in the race, he has to be near the top of our ante-post market at this stage."